Each and every day, over 500 unique types of wiggling germs make your mouth their cozy home. And that’s just KINDS of bacteria. Given that each kind can consist of well over 100,000 bacteria, you can understand why many dentists say that your mouth has more bacterial residents than there are people in New York City. And, just like New York City, they NEVER go to sleep. They only do two things: chow down on food left in your teeth and make bacteria babies. In reality, there is one more thing the germs do and that’s what causes all the problems. They dump out their waste product. That bacteria poop is toxic to your teeth and gums. Gum disease is a result of plaque, the sticky film of bacteria excrement that constantly builds up on your teeth. The bacteria’s excrement (plaque) contains chemical compounds that are destructive to your gums and your teeth. If you schedule regular cleanings with West Mill Smiles and follow our hygienists’ advice on home care, the plaque can be removed and gum disease can be prevented. In addition, gum disease’s damages to teeth and gums are also quite simple to turn around when caught early by West Mill Smiles. The hygienists at West Mill Smiles provide gentle, thorough cleanings that remove the plaque build-up that normal brushing can’t get to. They also provide education and instruction on how to get rid of the most plaque possible at home. Recent studies have shown an association between gum disease and increased risk of cardiovascular disease, stroke, low birth weight and diabetes. Because gum disease can have an adverse effect on your over-all health, Dr. Lee strongly suggests getting professional cleanings at least every six months. Gum disease is deceptively painless at the beginning, so you may not know you have it. Add to that the fact that gum disease is virtually impossible for the patient to self-diagnose and it becomes obvious why you need to see us regularly. At every visit, Dr. Lee and a West Mill Smiles hygienist will take depth measurements of the shallow, v-shaped crevice (called a sulcus) between your teeth and gums to determine if you have gum disease. 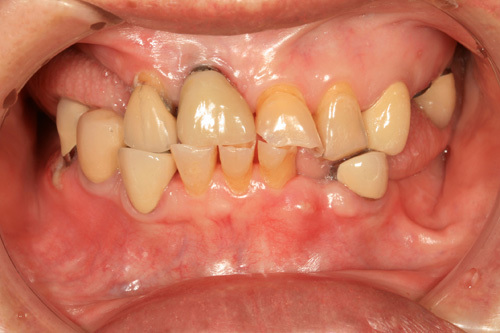 Gum disease attacks just below the gum line in the sulcus, where it damages the supporting and connective tissues. As the tissues are damaged, the sulcus develops into a pocket; generally, the more severe the disease, the greater the depth of the pocket. Over time, the pocket can become so deep that your tooth is no longer attached to your gums or jawbone. And, that’s when they fall out.